Yakupov and Nichushkin: Does a Swap Make Sense? If you haven’t heard by now, Nail Yakupov has reportedly requested a trade out of Edmonton. He’s had a quite a bit of trouble in Edmonton but has shown flashes of what he is capable of doing. There certainly is still potential there but it feels as though he could use a change of scenery. Then there is Valeri Nichushkin, the promising young power forward with the Dallas Stars. Like Yakupov, Nichushkin has struggled with consistency in his short NHL career and has been moved up and down the lineup. If you haven’t heard what is going on with Nichushkin, I point you to the Tweet below. Nichushkin interview to @sportexpress: "Don't know what I've done to Ruff. Won't let me play. Hitting head against wall. Huge lump by now"
Before we go anywhere else it is important to take that with a huge grain of salt. The “won’t let me play” line is interesting and makes me skeptical that there really is any issues with Nichushkin at all. He’s averaging over 13.5 minutes a night with most of it coming at even strength. According to leftwinglock.com, Nichushkin has played over 25% of his 5-on-5 ice time with either Mattias Janmark and Jason Spezza or Jamie Benn and Tyler Seguin. While I’m sure it has been frustrating at times to move up and down the lineup, everybody on the team has done that. Lindy Ruff changes up his lines incredibly frequently, almost to a fault. Nichushkin isn’t getting benched for long periods of time or seeing just a few minutes on the fourth line each night. He’s playing, and for the most part he’s playing pretty well. If Nichushkin’s frustrations with Ruff are legitimate, where do the Stars go from here? Nichushkin is really just in his second full season at the NHL level after missing almost the entire season last year due to injury. That certainly held him back in his development but it appears he is on the right track. Do the Stars give him up thinking he won’t end up being the player they thought he’d be? If they do decide to go that route, a Yakupov and Nichushkin swap may make a lot of sense for both parties involved. Both Yakupov and Nichushkin have shown flashes of brilliance at the NHL level. It isn’t fair to call either of them busts at this point as they are still young and have plenty of time to shine. In his career, Yakupov has put up some decent point totals on some really bad Oilers teams. His production has slowed this season, in part due to injury. However, you would expect him to be putting up higher totals considering who he has played with for a good chunk of this season. According to Corsica Hockey, Yakupov has played almost 127 minutes of 5-on-5 play with Connor McDavid and Benoit Pouliot this season. While in that group, Yakupov has produced 7 of his 20 points this season. He scored just seven times all season long despite getting well over 14 minutes of ice-time per game. Without a doubt, Yakupov is trending down. Nichushkin has put up 27 points this season but has played in 16 more games than Yakupov. Most of Nichushkin’s scoring does not come from one line, as his production has been spread out over many line combinations. He’s racked up three 5-on-5 points with Benn and Seguin, two with Janmark and Spezza, three with Janmark and Ales Hemsky, and two with Spezza and Patrick Sharp. In total, he has put up 20 points playing 5-on-5 hockey this season. Neither players’ numbers are overly impressive but they don’t scream bust yet either. If both Jim Nill and Peter Chiarelli think the player on the other side needs a change of scenery, the swap could make sense. That being said, who has more value at this point? It may seem like a small difference but Nichushkin is a year and a half younger than Yakupov. Nichushkin’s entry-level deal expires after this season and it’s likely he will get some sort of bridge deal at a low cap-hit. 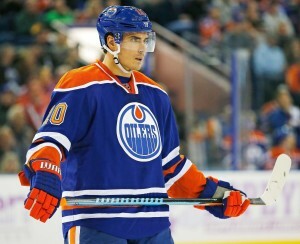 Yakupov will come with a cap hit of $2.5 million per season which will remain in effect through next season. For a team like Dallas, who is inching closer and closer to the cap, do you want to potentially add a higher cap hit than what Nichushkin will cost in his next deal? Since Nichushkin was drafted in 2013, he has put up 54 points playing 5-on-5 in 160 games. In that same time-frame, Yakupov has put up just 53 points playing 5-on-5 in 201 games. Yakupov is generally more sheltered in the offensive zone than Nichushkin, evident by a 6% higher offensive-zone-start-%. Another key factor is the size of Nichushkin. Skilled power forwards are a commodity in this league and he holds that advantage over Yakupov. Nichushkin is listed at 6’4″, 205 pounds while Yakupov comes in at 5’11”, 195 pounds. Nichushkin’s power has been evident on the ice as he is extremely difficult to move off of the puck. For this deal to make sense, you’d have to think that the Oilers would sweeten the pot to make it work. Nichushkin likely holds a bit more value at this point in his career, especially because his contract will almost certainly come cheaper than Yakupov’s current deal. With both players (allegedly) unhappy, a swap involving the two could make a lot of sense. While we’re at it, let’s throw Jonathan Drouin in the mix to give us the rarely seen three-team-trade.